Royal Mail have recently launched some new stamps which feature Kings and Queens from the House of Stewart. Pictured is the first class stamp which depicts James I who reigned from 1406 to 1437. James II and James III also feature on the first class stamps. James IV and James V are pictured on the 62p stamps and Mary Queen of Scots and James VI are pictured on the 91p stamps. They are available to purchase from this week. British Airways' chief executive is in last minute talks to try and avert planned strike action due to take place this weekend. British Airways and the Unite union have been in several hours of talks today to try and resolve a dispute over cost cuts. If the talks fail cabin crew are planning a series of stoppages starting on Saturday. BA are expecting to be able to fly around 65% of its customers this weekend during the strike action with a total of 1,100 flights out of the 1,950 scheduled being cancelled. Cabin crew are also planning another four day walkout starting on the 27th of March. 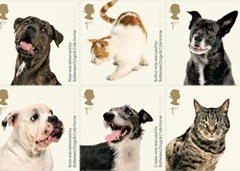 Royal Mail have recently launched some new stamps to commemorate the 150th anniversary of Battersea Dog and cats home. The stamps feature a number of animals that have been re-homed by the organisation over the years. A detail in the recent agreement between Royal Mail and the Communications Workers Unions will mean that they are no longer limited to delivering just three items of junk mail per household. This could mean that there will a sharp rise in the amount of junk mail that Royal Mail customers receive. If you want to cut down on the amount junk mail that you are getting this article has some useful tips. It suggests sending an email to optout@royalmail.co.uk with your name and address stating that you do not want to receive door to door mail. Writing to your local delivery office telling them to end deliveries of unaddressed mail and registering with the Mailing Preferences Service as just some of the ways to cut your junk mail mountain. PC2Paper are pleased to announce that we have reduced the cost of our colour laser printing. The cost per page has recently reduced from 60p a page to just 30p a page on our standard 80 gsm paper. We have also recently added a new 100 gsm paper option for those prints when you want a slightly better quality paper.